There are many ways to get involved and support our work & programs. Speaking out is already acting/volunteering for the benefit of wildlife conservation. But you can take a step further and also volunteer locally, or volunteer abroad for short or long-term periods. That is, you can donate your time… You would be surprised how much you can do and if well guided how much you can really contribute to helping. ✍ EwA Contributor Role » A Great Way to be Active in our EwA Community! If you’re too busy to volunteer a few hours a week, but still want to be part of EwA, then an EwA Contributor role is for you! Our contributors contribute articles of their choice (but which topic has been discussed with EwA) when they want and can. We have an acknowledgment section on our community page where we thank and name our contributors explicitly. When a contributor contributes more than a few articles on a regular basis or is active with EwA, then s/he is listed on our community page as a regular contributor with a profile blurb for the time of their active contribution to EwA. EwA contributors’ articles are posted on all our social media and are candidates for promotions (i.e., EwA paid advertisement providing more visibility to both the article and the author/contributor). Our contributors who cannot commit as volunteers like this role a lot as it gives them visibility with each of their articles that we publish on our platform and social media. Being an EwA contributor is also the first step when applying to EwA volunteering and get the opportunity to have a bigger EwA role and benefit from our resources. That is, we ask EwA volunteer candidates to first try an EwA contributor role for a short while. We take our contributors and volunteers very seriously, and that’s is why we dedicate real time and resources. This process greatly helps our volunteer candidates in evaluating their role and assignments at EwA, and see how it feels to work with our community and team. In short, with getting a chance for the volunteer and EwA to work together through an EwA article contribution, it helps to see if volunteering with us is something that s/he would really enjoy and commit to… A win-win for all! If you want to contribute or have any question about this program, don’t hesitate to contact us!  Volunteering and Internship at EwA » Welcome to the EwA Family! Our volunteers and interns like EwA, because we care for them, and take their role very seriously! One important question then to ask yourself when you want to volunteer with us is if you’re truly able to give regular time to EwA (amounting to ~15+ hours/month of active contribution as a volunteer, or 10-15 hours/week as an intern), as we require as we commit time and resources to help develop many skills including professional skills and agenda. Another important step is to read the EwA Volunteer Handbook . Our long-term volunteers are fully integrated into our organization (EwA dedicated volunteers get an EwA email, personal and shared server space, development environment and apps, etc.). All our content, activities and events are free to our volunteers. Our volunteers also benefit from major discounts on external events and training opportunities that help 501c3 nonprofits. And we help actively our volunteers to develop their skills and career. 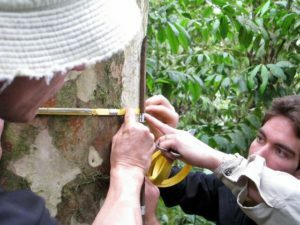 We’ve also been asked to be job references by some of our volunteers, and we’ve been glad to provide genuine and detailed work recommendations for candidates in conservation and ecology fields. They made a difference for each of the volunteers who asked. We also have internship positions available —ideal for undergraduates and graduate students preferably studying environmental sciences, ecology, and/or conservation biology (⟶ EwA Internship Program Details). Questions or interested in volunteering or interning with us at Earthwise contact us and we’ll be glad to tell you all about our roles and programs! And if you wish to volunteer for nature and conservation organizations, join a citizen project, or want to donate to a cause, you can follow us on our social media (Facebook, Twitter, Instagram, Youtube, LinkedIn, Google+) and check the organizations and projects that we discuss… You can also contact us and discuss directly with us about it. We remind you that our mission is not to recommend any organization specifically –but rather to coach our followers so that they can identify ethical opportunities, and choose and promote responsible venues. However, on occasions, we mention and may praise a few organizations that we are directly involved with or for which we have a high degree of confidence (at the moment that we mention them). Although it should never prevent that you do own research. Again never take a piece of info for truth simply because someone or a supposed conservation organization says the venue benefits conservation or the welfare of an animal. Too many well-intended volunteers, tourists have fallen into that trap. Nobody is safe from making this mistake, we included (and if we do and you know something that we don’t you can always contact us). We’ll be glad to listen, discuss, help. Of course, we need your help so that we can continue developing EwA’s Eco-Ethics framework, our guides, our etiquettes, our outreach programs. We are a small team and it is pro bono work on our part. Our funds at this time are mainly seed funding from the founders. We are savvy and work hard at operating at minimal cost. If you don’t like the look of a button on our page, a menu highlight – well… chances are that we don’t either. But the beauty is that we did set up this site at minimal cost (countless hours of work excepted) and learning how to handle or work around constraints. Then enjoy it as much as we do just for this reason: It shows clever work, dedication, and passion! And if you want to volunteer with us, give us ideas or participate in what we’re doing: don’t hesitate to contact us! 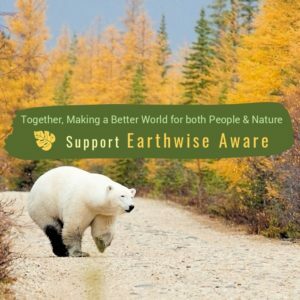 ▹ Another way to benefit Earthwise Aware is at no-cost to you >> Sign up for Amazon Smile! It is easy to set up. Once you do, instead of going to Amazon.com to shop, you go to Smile.Amazon.com. Everything at Smile is exactly the same as you are used to at regular Amazon, same products, same prices. If you have a Prime account, it will still be there in Smile. The ONLY difference is that 0.5% of your purchases are donated by Amazon to Earthwise Aware. Eventually, this adds up and helps us! Thanks! Sharing is caring This helps both our World and our work! Connect with us, follow us, like us & spread the word! A great way to support what we stand for is to keep an ear and our mind open, to get the ecological knowledge about how to be ethical and responsible. Hear the issues, learn about them from reliable sources, ask experts or ask us if you’re not sure and then talk about it. Talk, discuss, challenge issues, wildlife ethics, environmental behavior with your kids, your parents, your siblings, at work. In short,  talk about it whenever and wherever you can… That is the first most important action and everyone can do it. Then remember to ‘act your words’: We all can be citizen conservationists. Sharing is caring; Help us and spread the word about our work.